AUTHOR INFORMATION: Matthew Reilly was born and brought up in Sydney, Australia. He studied law at the University of New South Wales and wrote his first two books while being a student. He self published his first book which lead to his eventual publication by Pan Macmillan. He is a cricket aficionado as well as a movie memorabilia collector. One of his prize items is a DeLorean DMC-12 and other items from the Star Wars and Indian Jones franchises. When Dragon Island is seized by a brutal terrorist force calling itself the Army of Thieves, the fate of the world suddenly hangs in the balance. But there are no crack units close enough to get to Dragon island in time to stop them from setting off the weapon. Except, that is, for a small equipment-testing team up in the Arctic led by a Marine captain named Shane Schofield, call-sign SCARECROW. It's not a strike team; just a handful of Marines and civilians. It's not equipped to attack a fortified island held by a small army. But it will go in anyway, because someone has to, THE ULTIMATE HERO IS BACK, FACING THE ULTIMATE ARMY OF VILLAINS! FORMAT/INFO: Scarecrow Returns is 359 pages long, divided over seven section (Phases) and a prologue, each section is further divided into several small chapters for a rough final count of hundred-plus chapters. Narration is in the third-person via various characters such as Shane “Scarecrow” Schofield, Gunnery sergeant Gena “Mother” Newman, Dr. Vasily Ivanov, Jeff Hartigan, Veronique Champion, Hammerhead, Zack Weinberg, The Lord of Anarchy, David Fairfax, corporal Billy Thompson and a couple other characters. Scarecrow Returns is the fourth book in the Shane “Scarecrow” Schofield series. ANALYSIS: Matthew Reilly’s story to publication is one as wondrous as one of his books. Borrowing money from his parents to publish his debut book and then doing his own publicity and selling the book to local bookstores was quite a task. His book then caught the attention of a publishing persona and based on the potential seen in the book, lead to him being offered a two book contract. The first of those two books was Ice Station & since then Matthew Reilly has never looked back. I happened upon his books when I was starting out as a reader and was enamored by his adventure-laced, action-packed thrillers. However in the last few years, I was disheartened by his Jack West Junior thriller series and they remain the least liked among all his books with his fanbase. When he announced that his next book was going to be a return to his most beloved character, I was ecstatic and wanted to see whether he would be able to top the poignant finale of Scarecrow [3rd book]. I believe a bit of background is required before I begin the review, the first three Scarecrow books have taken place in such varied locations such as Antarctica, Utah desert and a pan-global race. The first book had Scarecrow saving his team, the second one his nation and third one the entire world. With such a progression and with certain events taking place in the third book, most fans felt that the series had come to its natural conclusion and it would require a herculean effort from the author to write a fourth book to continue the series. Often authors return to characters best left alone and the way this story starts, I got that feeling but before it could take root, Matthew spun his magic. Also on a side note this is book four and therefore not the ideal place to start reading the series as various ennui of the past books have been revealed. The story begins with a series of reports detailing certain events that herald the ascent of the army of thieves. The scene quickly then shifts to a little known Arctic island called Dragon Island, wherein previous Russian cold war experiments have left a weapon of sorts which has been overtaken by the army and its deranged leader. Calling himself the Lord of Anarchy, their leader announces his intentions of rescaling the world’s current power scenario and activates the weapon which will detonate in a little over five hours. The team closest to dragon island is a civilian one lead by Shane Schofield who are testing some equipment. They are ordered to do whatever it takes to sabotage the detonation process. Thus begins the return of Scarecrow which will see him and his team fight foes on a magnitude beyond their imagination and stop a global genocide within five hours. The book is a kind of fresh start for the main character and the author’s decision to have the action centered in another icy location (akin to the events of the first book) was a meaningful one. Also it was all the way to the other side of the pole and this time around, there are fewer recurring characters from the previous books. 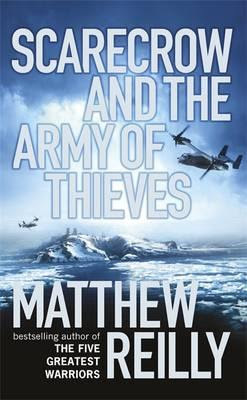 Matthew Reilly’s books are like popcorn blockbusters wherein there are a ton of action-packed sequences, cheesy one-liners, twisty plots and overall a fun feeling when you finish the book. Perhaps when it comes to these type of thrillers he has no equal. This book has his trademark signature sequences, wherein action and chaos unfolds over pages and the heroes manage to live by some insane idea which just has the right amount of luck and skill to make it work. The book’s plot doesn’t just have a single thread but consists of atleast three-four threads which continue to unfurl on their own and later on unite to form an exciting plot. For the returning reader there are various nods and connections to the previous books which continue to strengthen the cohesiveness of the overall series. Previously on reading a couple of Matthew Reilly’s books, a reviewer had remarked that he doesn’t really give his characters any space to breathe or any time to grow as his books have frequent and gruesome character deaths. This characteristic is present this time around as well and what’s more there are quite a few deaths in this one. Perhaps the author has introduced a sense of seriousness with his choices in the third book and this time around also there are a few things by which the author reinforces his intentions. The biggest guessing game for the readers has been as to where and when Mother will bite the bullet and the author has certainly hinted at it in the past books and he continues that game over here as well but I’m not going to tell you what happens to her. Lastly this book is the most introspective of all the Scarecrow books for reasons which will be apparent to readers of the previous books and the author quite wonderfully plays on that thread showcasing a wounded & perhaps mentally unstable protagonist. This introspective element is also shined on a couple of other recurring characters however the main focus as always is Scarecrow. With this book, the author showcases that his previous series was a not an indicator of him losing his touch, there’s plenty left in his imagination to wow his fans all over again. I must also point out a few things before I go on, these books have to be counted as pure entertainment, nothing more and nothing less! While Matthew’s writing talents have bought a smile to many a fan, his books have left plenty unsatisfied. Readers looking for a deep nuanced, character driven read will not find it here; these books are the equivalent of Michael Bay films if they had some semblance of a plot to go along with the action. You can expect simple comedy and the thrills associated with cliffhanger chapter endings but as always at the back of your mind, you know that the hero somehow makes it. Predictability of the plot is not to be taken for granted but predictability of the protagonist’s survival is a given. Characterization is also somewhat shallow as most characters can be easily divided into the good & evil camps, though the author springs a few surprises from time to time. This book has one of the most endearing non-human characters a robot called Bertie & I’m hoping readers will get to see more of Bertie in the future as well. Lastly for first time readers this book might not be the best place to start as a lot of surprises of the past three books are revealed but this is required to explain many a scenario and character interactions in the book. CONCLUSION: Matthew Reilly triumphantly returns to the type of stories which have earned him fans on a global level, combining trademark action sequences with stereotypical dialogue but with a greater emotional quotient, Scarecrow Returns manages to give the readers an excellent read. Fans of his earlier books can be assured that they will find what they have been missing for the past few years and this book heralds a new direction for our favorite marine. 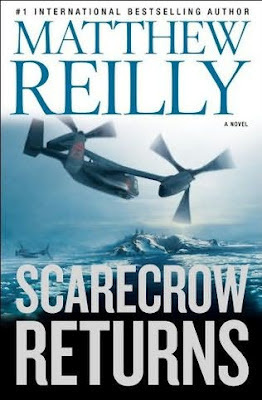 Give Scarecrow Returns a read and discover why Matthew Reilly is the unmatched master of the most imaginative action-thrillers ever written. I loved the Jack West Jr novels. They were as ridiculously over-the-top as the Scarecrow books, but West's background as an archaeologist transformed them from mere action-thriller to Indiana Jones on crack. And honestly, my interest in Scarecrow waned after he fought an island full of killer apes. Give me a Black Knight book before yet another Scarecrow entry. Fair point, I happen to like the Scarecrow books and didn't the Jack West Jr. ones and yes a Black Knight book would be definitely cool to read. Btw in MR's Defense, he wrote Hell Island as a part of a literacy campaign in Australia to get young kids to start reading and in that regards, he could be forgiven for putting his trump card character through a lurid storyline. Really disappointing to find that Scarecrow and the army of thieves is the same book as the Scarecrow Returns. I thought I was getting a new book in the series. Turns out I've book the same book twice. Really unfair to have different titles for the same book.